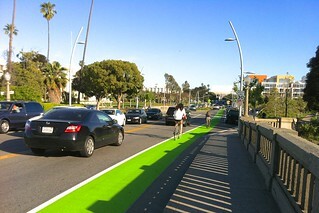 The city of Santa Monica has recently nudged further into implementation of the Bike Action Plan with green paint that arrived on Main Street and Broadway getting new paint, currently still in progress in some areas and completed in others. Santa Monica is a fairly popular filming location in its own right. 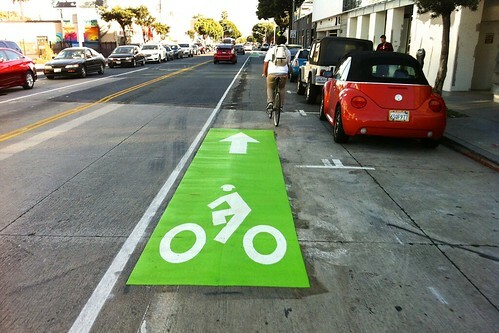 Going bold and solid on the green bike lanes, the city appears unconcerned with the Film L.A. push back that convinced city of Los Angeles officials to substantially roll back the use of green paint on Spring Street in Downtown L.A. Some analysis of the use of color delineation for bike lanes has shown measurable improved compliance of drivers respecting such lanes, and subjectively there is something to the effect of the “green carpet”. Since the color is unlike any used elsewhere in typical road markings, it pops out in a way that just a typical white line does not (and honestly it’s not that hard to remove in post production filming if so desired). Some sources caution that beyond a certain point of implementation there are diminishing returns on effect, and advise focusing on “conflict zones” such as intersections. The realities of road marking budgeting in most municipalities also necessitates some selective focus upon planners and engineers working within those constraints. So it’s not entirely surprising to me that we are seeing solid green only for a limited number of blocks on Main and Broadway, and only the thermoplastic reflective green backed bike lane symbol markings and intersection transitions for the rest. Green backed bike symbol in reflective thermoplastic on segment of Main St. not receiving continuous green. 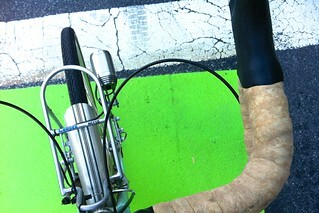 You can see buffed out marks were white line was before, adding extra width to the bike lane. I saw various speculative comments about the partially completed work flying around on Facebook, but I confirmed with city transportation engineer Jay Dinkins yesterday that Main Street from Colorado Ave. to Pico Blvd. 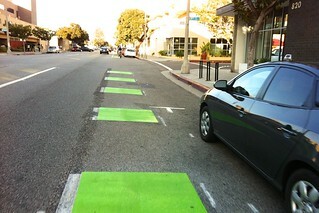 are the only blocks getting continuous green on Main, and from Pico to the city border will be getting partial green. Broadway will be getting solid green from 5th St. to Lincoln, which has not yet begun, and beyond Lincoln Blvd., green backed bike lane symbols and intersection transitions started going down within the past few days. Completion of the full project on both streets will be about a month, with green going down first, and finalized white line work, including a line delineating the parking lane (as opposed to just the present “T” marks on Broadway & on Main) coming in last. The use of green lanes has spread to cities and towns throughout the U.S., big and small, including places some might not expect if they pigeon hole bicycling narrowly as just a uniquely left leaning progressive cause. It’s still a relatively uncommon sight in Southern California (although I saw quite a lot of it in the Bay Area recently during my California Bike Summit trip last November), but Santa Monica has quickly multiplied the regional proliferation of greenness with it’s own recent efforts. Also appropriately just in time to add green to some of the St. Patricks Day festivities on Main Street, which I noticed as groups in green were strolling by. Green transition zone approaching intersection on Broadway. The green is encouraging, and I’m happy to see it, but in considering the few years since the bike plan was passed, it might be time to consider nudging the goal posts again, with efforts more squarely aimed at the “interested but concerned” potential rider. Those who wish to ride a bike, and could, but remain deterred by an environment too hostile from their perspective to be reconciled just with paint lines or color highlights. I was under the impression originally that the greening of both Broadway & Main St. would come with restriping that created more “buffer” space, still short of a physical barrier, but gives noticeably more wiggle room on both ends, from doors and passing vehicles. However it appears only Main Street consistently gained space by moving the outer white line out. Much of Broadway has not been shifted except in certain blocks that had more curb to curb width than others. The new green will help with visibility, but the lanes on Broadway remain a tight feel in a lot of it’s length and a less than ideal amount of space to work with when adjacent to parallel parking (and those who frequently fail in their obligation to consider others upon opening their door), as is the case for most of Broadway. When I talked to engineer Jay Dinkins he clarified that what isn’t as apparent yet is the parking lane is being tightened some, and they are aiming for 6 ft. bike lane space (5 ft. is state minimum) wherever possible under current code constraints on other lanes. Broadway will be getting a not yet painted white line for parking to make up some room on that end, but as I mentioned that is apparently coming last. Such lines do encourage parking closer to the curb, and will hopefully help a little once implemented, but it’s a little bit less than I had thought was going to be implemented. I hoped for something a little closer to extra breathing room seen on the bike lanes that were added to 14th St. & 6th, especially with Broadway being such a high bike ridership spine of the street grid already. My widely shared “door lane” image from 2010 critiquing minimum bike lane widths and the unpredictable hazard of careless driver door openings. 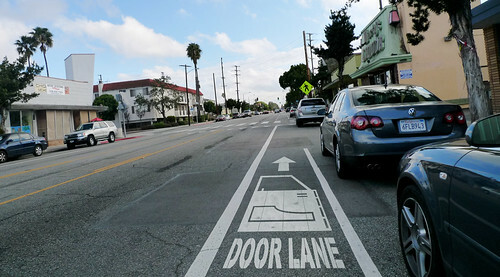 My Photoshopped image of the “door lane”, poking at the deficiency of minimum standard bike lanes adjacent parking,which I made available under creative commons licensing in 2010, remains my most viewed, favorited and reposted image of the more than ten thousand I have online. 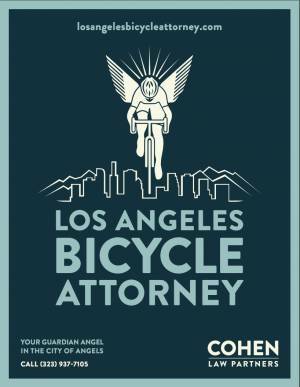 Clearly, it resonated with bicycle riders everywhere. I’m doubtful green will sufficiently mitigate that concern where it is not accompanied by more space and more specific efforts targeted at reducing instances of hazardous door opening. So I am left both encouraged but tinged by some disappointment, for Broadway. I frequently struggle between celebrating steps forward and wanting to strive toward going further. 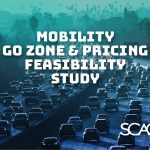 I also realize that Santa Monica is doing more, and proceeding faster than most cities and neighborhoods in the region, which I am both grateful for, but it’s also something that carries an element of guilt when reflecting on the even greater needs and hurdles to riding in other areas of the region. However it’s always been my hope that if Santa Monica, with it’s high profile within the region as a day trip destination, develops a strong “ecosystem” of transportation cycling beyond the beach path, that it can help inspire efforts beyond itself. 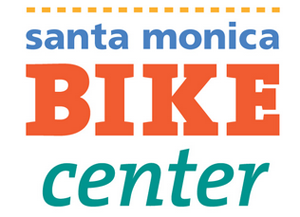 I know some point to Santa Monica being relative well off financially as the means for it’s ability to get things done, but it’s not the bike stuff that that really burns through budgets. Retrofitting just one of the city parking structures for earthquake safety is a more ambitious undertaking than pretty much the sum total of everything the city of Santa Monica has ever done for bicycling. Advancing bicycling is largely a matter of organizing political will, not insurmountable cost barriers. 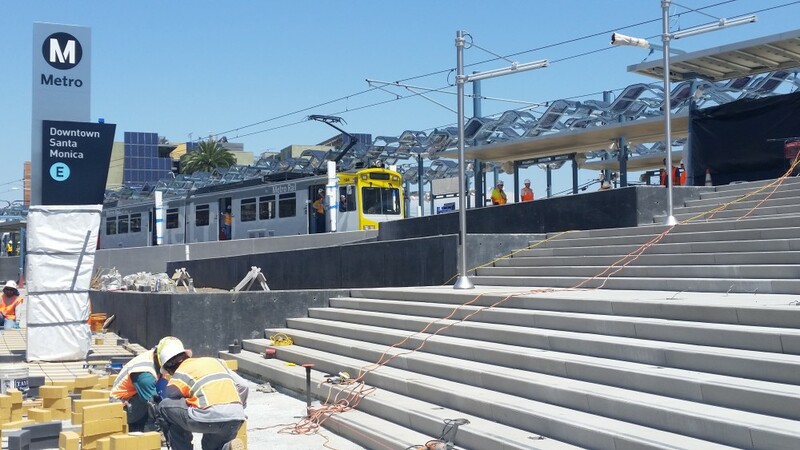 Everything being done for the sake of bicycling specifically is a drop of water in a lake when we consider the costs of massive engineering undertakings like the 405 widening or building the Expo Line and the Purple Line extension. 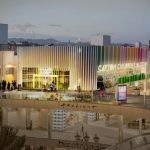 Let’s celebrate the extension of green and the bit of extra room on Main Street, but remain grounded in the realism that there is still a lot of work to do. 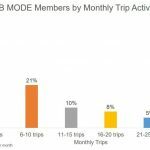 Bicycling ridership is up since the bike plan was passed in the commuter targeted census survey data, but remains modest in total (although the breaking past 5% is by U.S. standards, an achievement). 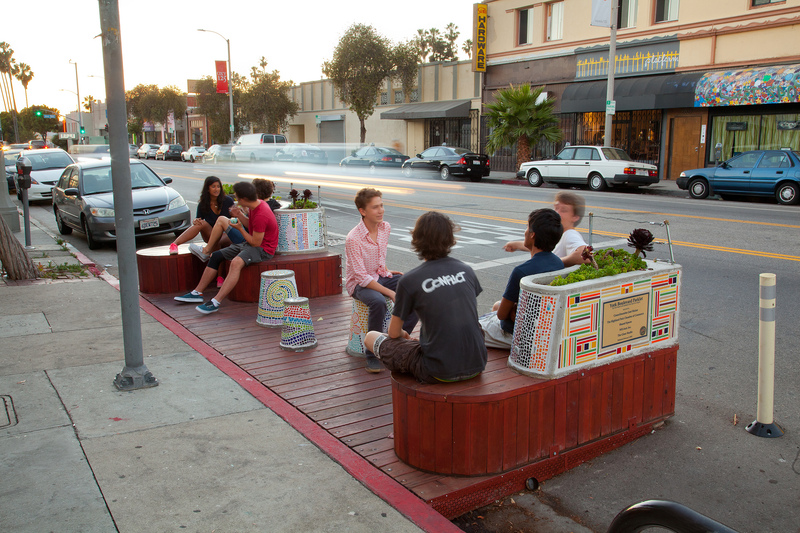 There are potential sites being considered for on-street cycle tracks, protected bike lane facilities, in Santa Monica, but we don’t have any examples yet, nor are any under construction at this time. 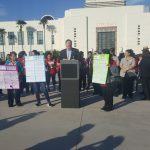 In that particular regard there are already others in the region that have moved forward where we haven’t, such as Long Beach. Even Temple City in the San Gabriel Valley is set to debut gorgous new protected bike lanes soon. For the haters, they will always think we’re moving too fast, but the layers of consequences driven by deeply entrenched fossil fuel and oil dependency for nearly all transportation tick onward, ever accumulating, without regard for our delays or sense of attachments to the status quo. For the sake of the future my generation will live to see, and those who will live beyond that, we must realize that even the places now moving fastest toward embracing the necessary energy transition ahead of us, of which greater adoption of bicycling is one component, are all moving much too slowly.